Hang the moon around your neck with an elegant necklace. 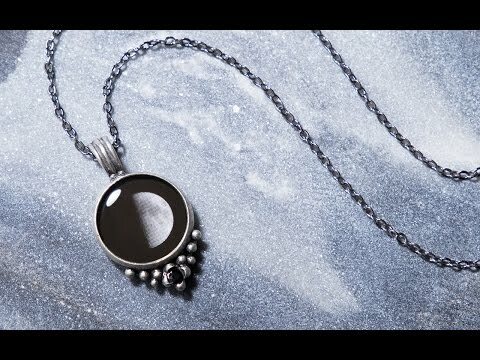 A moon phase necklace captures the moon in a specific phase and places it into a necklace full of meaning. Choose from any moon phase that's special to you—from Full Moon to New Moon, and even including a Lunar or Solar Eclipse. Dimensions: Pendant: 0.5" diameter x 0.11"; Chain Length: 18"
Maybe you believe the moon influences our personalities. Or perhaps you simply like gazing up at this mysterious glowing sphere. 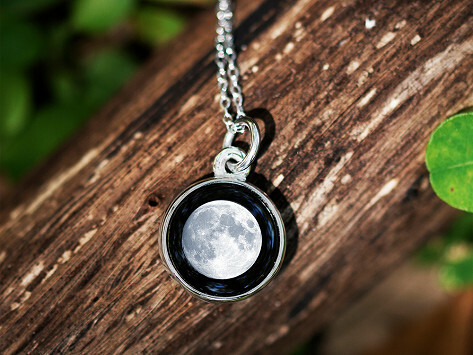 Either way, Moonglow’s moon phase necklace is a meaningful way to commemorate important dates or events. Featuring pendants with a subtly luminescent moon phase, these pewter necklaces are the creation of Canadian artist Luc Rouleau. He’s quite passionate about the celestial orb circling nearby. In fact, he can name—from memory—the cycle it was in during any date from the last century. But you don’t need to memorize like that, because Moonglow will find the right phase for any date you choose—and deliver the appropriate necklace. They even include a card to give you more context about the moon cycles and explain the traits associated with each. Luc’s design has an antiqued, vintage feel dotted with a single Swarovski crystal. Honor a birthday, anniversary, or even just your favorite phase of the moon by keeping it close to your heart.